Let me get this out of the way. I love Kermit. Miss Piggy loves Kermit. For the longest time I have had the Miss Piggy photo as my Facebook profile photo and I doubt that I will remove it anytime this side of this century. So why does she love the green man who clearly isn’t in love with her? I think it has something to do with hope… (Okay, this is not at all the direction I thought I would be taking with this post!) The reason why a man will keep on going back to the street to look for his wife who is a prostitute and beg her to come back home. The hope that she is going to change keeps him loving her. The reason why a woman will be kicked like a donkey by her better half, insulted like a dog and treated like a snail but still wake up early in the morning to prepare him for work – iron his shirts, cook his breakfast and pack his lunch. So much for being hopeful. It also represents anytime I get myself into a stupid crush. And end up liking someone just because they preached so well or just because they sung that song during holy communion so well or because they made a date with me 2 months in advance or because they helped me arrange dishes in the kitchen. All that is just one person by the way! I tell myself that it is a ‘Kermit situation’. Green, watery and just about to dissappear from the surface of the water…… Yeah…………….. 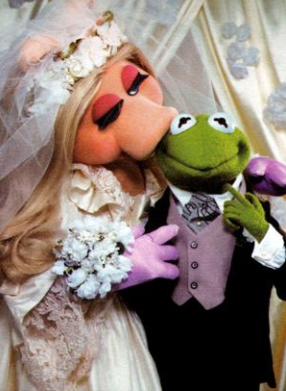 Check out the day when Miss Piggy FINALLY got Kermit to say ‘I do’. PRICELESS!